This installment on Bill 41 comes after a longer review of the Ontario Hospital Association’s backgrounder on Bill 210 released earlier this year. They have not published anything specific to Bill 41. My personal concern about Bill 41 is based on my alarm over the extraordinary amount of control the government feels it needs over what doctors, agencies, hospitals and LHINs are trying to do locally to look after patients. 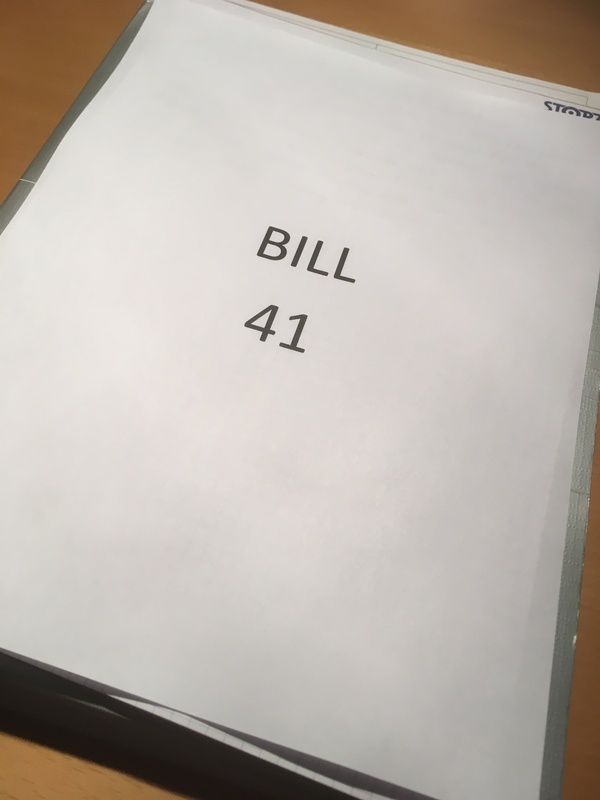 This is the fourth time I have written about Bill 41 and the longer I look the more alarmed I become. What on earth makes the Toronto-based Ministry of Health and Long Term Care (MOHLTC) believe it has the answers to how health care must be organized in regions so different and so remote from each other that many of the citizens in one have never been to another? Let’s begin with the Expansion of the Minister’s authority over hospitals. Any time the government feels a need to expand its legal authority, it’s important to examine why their moral authority has not been effective in driving change. What Bill 41 really does is allow the Minister to override the decisions of local hospital boards, setting directives and standards. Having served on my hospital’s board in my capacity as President of the Medical Staff Association, I can state that our hospitals in Ontario are well-governed, put patients first and that their boards are populated by local experts who have the best interests of the patients and population at heart. The Minister has not given one reason why he needs to interfere with this. The doctors in a hospital can presently raise concerns with a Board through the Chief of Medical Staff or the President of the Medical Staff and their opinions are sought out and seriously considered. This is very different from doctors’ experience with government. Further authority for the Minister over hospitals is not good for either hospitals or the physicians who work in them. Secondly, let’s consider how the changes in Local Health Integration Network’s (LHIN) functions and governance could affect hospital physicians. The bill expands the list of health service providers to include family health teams, hospices and “any other person or entity set out in regulations”. Some family health teams and hospices are hospital-based and all of those are staffed by physicians, so these doctors will be affected. In fact, it is important to remember how many primary care physicians provide hospital services. We tend to think of consultants being affiliated with hospitals but many hospital emergency rooms, operating rooms, wards and other services depend on family physicians to provide care. Many Emergency Rooms in smaller communities only remain open because their dedicated medical staff provide extra coverage. They don’t need Bill 41 to tell them what needs to happen. What I find most concerning about this section on LHIN functions and governance is that the Health Professional Advisory Committee, which all LHINs must have at present, becomes discretionary under Bill 41. When LHINs were first introduced by the Liberals in 2006, the Health Professionals Advisory Committees were criticized as providing too little direct physician input into local health decisions. Now LHINs will have an option of excluding this group altogether. Why is there this need to exclude doctors from all healthcare decision-making? As for home and community care and public health, all physicians must access these services for their patients and this includes hospital physicians. As a physician, I depend on community services for my most disabled patients. These services need more front line staff and a better capacity to deliver service in a timely fashion, not this extra bureaucracy that will tie up caregivers with paperwork. Most importantly to all doctors who work in hospitals, all of us do see ourselves as being community physicians as well – after all, the hospitals where we work are in the communities where we live and are part of the fabric of our towns and cities. Hospitals and their medical staff contribute to the prosperity of towns and cities. Doctors care deeply about the prosperity of their communities and the quality of care provided by hospitals. Bill 41, with its need to bring greater control over health and health care decisions, is insulting doctors by giving the impression that these measures are necessary. The doctors in my community are working very hard to ensure that our care addresses patients’ needs. Many of us are volunteers on hospital boards, hospital committees, LHIN committees and Health Professional Advisory Committees. Is the Minister suggesting that we should stop? That’s what it feels like. #1. What are your thoughts about Hospital CEOs and Boards? Will they eventually go by the wayside like British Columbia because the LHINs (and Minister) have much more direct control over Hospitals with Bill 41? A Hospital Board Director told me that she/he was ready to hand in his/her resignation after reading Bill 210/41. They feel like they no longer serve a purpose and, after all, their time is largely volunteer based. #2. The language in Bill 41 is pretty clear. The Minister can act to change Hospital mandates in the “public interest” and this includes activities that decrease Hospital length of stay. As you know, LOS is the basic currency describing the activities in hospitals: from the Emergency Department to the wards, to the lab and the medical imaging department. Everything in hospitals is based on LOS. So, really, Bill 41 gives the Minister a lot of power to change the way medicine is practiced in all of Ontario’s Hospitals to meet the LOS metric. While on the outside that sounds great, I have many reservations on how that will play out in Ontario especially when physician input is ignored. What are your thoughts on these two points Dr Beck? ← Bill 41 – What about Specialists?